Contra / Gryzor shares almost the same hardware specs with Combat School / Boot Camp, Fast Lane, Flak Attack / MX5000, Haunted Castle / Akumajô Dracula and Trick Trap / Labyrinth Runner. But among these titles, it is the only game that offers a stereo output thru a 4-pin connector on the board (labeled CN2). First, you have to select stereo by plugging a connector on CN4 (and put switch 4 of DIPSW3 to off). As shown on the picture above, this connector originally comes with pin #1 wired to #2 and pin #3 wired to #4. In that way and plugged on the stereo connector (CN4), it mixes channel 1 and channel 2 from the YM3012 DAC to the LA4445 amp which results a mono output. To separate the channels, you have to simply modify the connector by wiring pin #1 to #3 and pin #2 to #4.
ps. 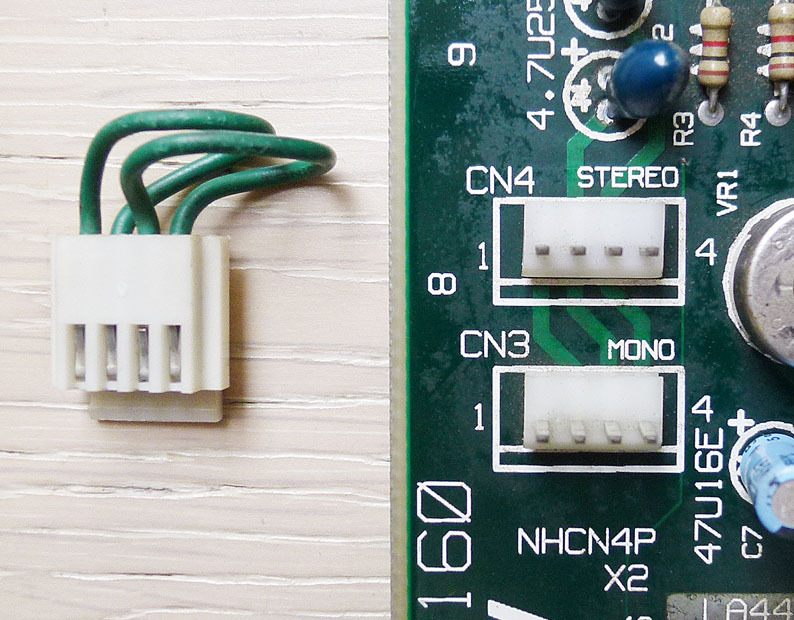 If anybody knows if the original wiring on these boards allows to deliver stereo sound or any other board that is using this connector, I would be glad to know and add it here. I was intrigued by this and own Trigon, Parodius Da! and Contra. I tested it with Contra, and indeed it was mono only and is now stereo. However, Parodius and Trigon are in stereo without modifying the connector. I checked all my other Konami boards, and could only find one other that used the same connector, it is Top Gunner. However the PCB I won does not have the stereo position soldered in in order for me to check, and I have none around to solder it and test. Curious to see if stereo is working with or without modification on that one.